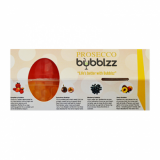 Cocktail bursting bubbles are juice filled bubblzz which pop under gentle pressure for a flavour burst sensation. 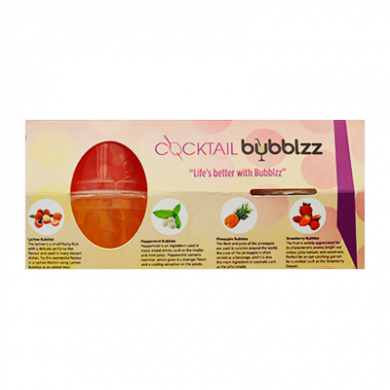 With this new cocktail kit you have four flavours of juice bubbles to add to your favourite cocktail and create a unique Bubblzz cocktail! 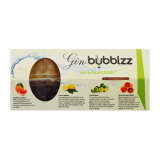 Contains 4 x 100g individually sealed packs of Bubblzz: Lychee, Peppermint, Pineapple and Strawberry. 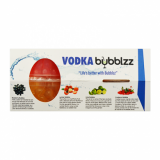 Lychee, Peppermint, Pineapple and Strawberry flavoured bursting Bubblzz. Lychee Bubbles:Water 57.05987%, Fructose 38.52%, Calcium Lactate (E327) 1.06%, Modified Starch 1.02%, Lychee Syrup 0.78%, Malic Acid (E296) 0.55%, Sodium Alginate (E401) 0.51%, Xanthan Gum (E415) 0.23%, Propylene Glycol (E1520) 0.11%, Improver (Locust Bean Gum (E410) 40%, Xanthan Gum (E415) 40%, CMC (E466) 20%) 0.09%, Lychee Flavour (FEMA - 2419; 2940; 2137; 3487; 2309; 2507) 0.01%, Clouding Agent (Distilled Water 30%, Starch Sodium Octenyl Succinate 25%, Glycerin Fatty Acid Ester 20%, D-Sorbitol Solution 70%, Propylene Glycol 10%, Citric Acid Anhydrous 5%) 0.01%, caramel (E150) 0.0001%, FD&C Yellow 5 (E102) 0.00003%, Potassium Sorbate (E202) (under 0.05%). Peppermint Bubbles: Water 57.848%, Fructose 39.06%, Calcium Lactate (E327) 1.07%, Modified Starch 1.03%, Sodium Alginate (E401) 0.52%, Xanthan Gum (E415) 0.23%, Improver (Locust Bean Gum (E410) 40%, Xanthan Gum (E415) 40%, CMC (E466) 20%) 0.09%, Peppermint Flavour 0.09%, FD&C Yellow 5 (E102) 0.01%, FD&C Blue 1 (E133) 0.002%, Potassium Sorbate (E202) (under 0.05%). 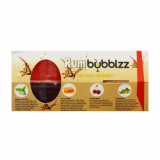 Pineapple Bubbles: Water 57.848%, Fructose 91.23%, Pineapple Juice 4%, Citric Acid (E330) 1.06%, Pineapple Flavour (FEMA - 2137; 3487; 2825; 2940) 0.48%, Clouding Agent (Distilled Water 30%, Starch Sodium Octenyl Succinate 25%, Glycerin Fatty Acid Ester 20%, D-Sorbitol Solution 70%, Propylene Glycol 10%, Citric Acid Anhydrous 5%) 0.02%, Acesulfame Potassium (E950) 0.01%, Sucralose (E955) 0.005%, FD&C Yellow 5 (102) 0.004%, FD&C Red 40 (E129) 0.00003%, Potassium Sorbate (E202) (under 1g/Kg). Strawberry Bubbles: Water 57.049%, Fructose 38.53%, Calcium Lactate (E327) 1.06%, Modified Starch 1.02%, Strawberry Syrup 0.78%, Malic Acid (E296) 0.55%, Sodium Alginate (E401) 0.51%, Xanthan Gum (E415) 0.23%, Improver (Locust Bean Gum (E410) 40%, Xanthan Gum (E415) 40%, CMC (E466) 20%) 0.09%, Strawberry Flavour 0.09%, FD&C Red 40 (E129) 0.04%, Sodium Metaphosphate 0.001%, Potassium Sorbate (E202) (under 0.05%).